The ends are modeled after Victorian spoons. 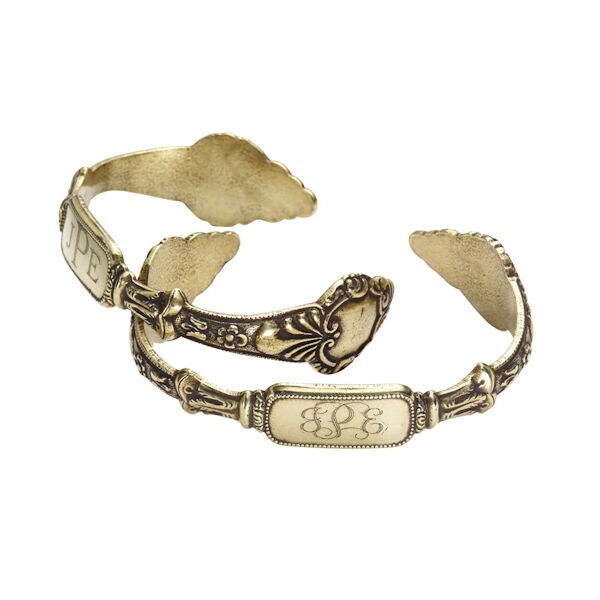 The center part is etched with your monogram. Beautiful and unusual bracelet is solid brass with an antiqued finish to look as though you've had it for years. ¾" wide, slightly adjustable, it fits most wrists. Made in USA. Specify initials in this order: first name, middle name, last name. The last name initial will be in the center, in the traditional style. Specify Block or Script letters. Allow 3 weeks. No rush delivery or gift box. Item can only be shipped within the Continental US.